Get excited CCC! 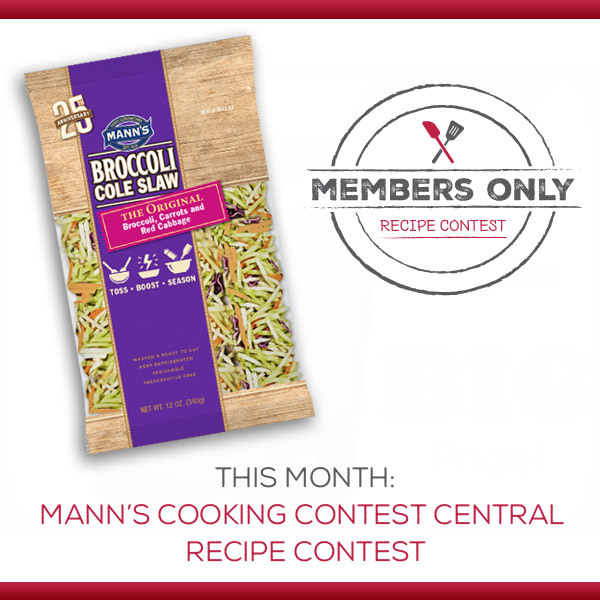 We have teamed up with Mann’s to co-host a members only recipe contest featuring their iconic Broccoli Cole Slaw! This contest is to commemorate the 25th anniversary of Mann’s bringing the original broccoli cole slaw to consumers. We are asking our members to find their most creative ways to “Toss, Boost, or Season” their favorite recipes using Mann’s Broccoli Cole Slaw. Three Grand Prizes – Each winner will receive a $500 grocery gift card to the grocery store of choice. $1,500 total prize package. “Toss” Category – $500 grocery store gift card will be awarded to the slaw or salad recipe where Mann’s Broccoli Cole Slaw is tossed with other fresh and flavorful ingredients. “Boost” Category – $500 grocery store gift card will be awarded to the best recipe where Mann’s Broccoli Cole Slaw is added for a nutritional boost! Find creative ways to boost your favorite recipe with veggies. For example your morning smoothie, a batch of muffins or your best baked dish! “Season” Category – $500 grocery store gift card will be awarded to a recipe where Mann’s Broccoli Cole slaw is sautéed, seasoned and added to a dish. Think pasta dishes or stir fries! Judging: Recipes will be judged on overall taste and appeal (50%), creativity (25%), and ease of preparation (25%) by a panel of third-party food and recipe experts. There is no limit on the number of recipes you can enter, so why not give all three categories a try! All Entries become the property of the Sponsors and will not be returned. By submitting an Entry, entrant hereby grants permission for the Entry to be posted on www.CookingContestCentral.com or other websites. *If you haven’t renewed your annual membership or want to join Cooking Contest Central, click here. In addition to all the benefits of membership, you can now also enter exclusive members-only contests like this one! I would love to know who the winners were!